Calendar Books are becoming more popular these days! A Calendar Book is a little binder for each child with a copy of the monthly calendar in it for them to fill in daily, one number at a time. Calendar notebooks can be a powerful tool for increasing accountability to pay attention during this repetitive time of day, and to review lots of concepts daily. This is my “concept board” with all of our sight words stapled up next to the calendar so that children can practice them daily right along with their math concepts when we fill in our calendar book. I originally learned about the idea from the I Teach K Conference in Las Vegas in 2007, at a session by Shari Sloan. It sounded like a great idea, so I decided to try it. I took my masters from Shari Sloane’s website. She has a lot of prepared masters that you can download for your calendar book FREE! I also now have a lot of free downloadable masters for you as well! The general idea of the calendar book is that you start with a monthly calendar, and each day the children fill in their calendar in a notebook as you update your big calendar in front of the whole class. Then, as you go along, you can add in other pages to their notebooks to practice more skills. If you are counting the days that you are in school, then one natural thing to add is a 1-100 chart. Each day, the children write one more number into their blank hundreds chart, just as the teacher adds one more number to her chart. Shari Sloane’s master is very nice, because the first fifty or sixty numbers on the hundreds chart are dotted (traceable), so all the young kindergartners have to do is trace those numbers in. Later in the year, they will come to the blank squares and will be able to fill in their own numbers. Of course, if you teach older children, you can just give them a blank chart. There are lots of things you can add into your calendar books as the year goes by, such as an Odds and Evens chart. I purchased an odd and evens number holder at a conference somewhere. Isn’t it neat? But I numbered some Unifix Cubes and and patterned the colors so that the yellows were odd and the oranges were even. We put a new one in every single day, and then updated our book. Another thing they could add is a Write the Date chart. I created masters that are simply traceable dates, because my kids took sooooo long to write out the dates and such a hard time spelling the months and days. These have been updated for the year 2018 and 2019! I started with Shari Sloane’s masters, and then wound up making my own after a while so that I could tweak them to suit myself and add some cute clip art. Here are some things that I did with my class that made the calendar book work for me. I love to include language arts activities during our opening calendar activities, so I made up a few language arts themed pages to go in our book as well. 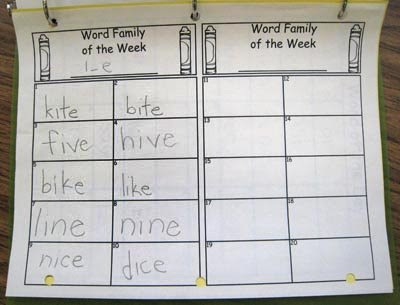 One thing I added was a sheet called “Word Family of the Week” in which they added one word per day from whatever word family we were working on, like -at words or -an words. After they wrote it in, everyone would touch and point to all of the words, and read them together. The children copied them off of this Word Family of the Day chart that I got at ReallyGoodStuff.com. Then I added another one called, “Sight Word of the Day,” in which they added one new sight word each day. We didn’t add these papers in, though, until the last three months of the year. Otherwise, we would have been up to more than 150 words, and that is WAY too much! It also helped to number the boxes on the page, and set up the page so that it matched my concept board (a calendar board with some other concepts thrown in on the same wall right next to it). That way, if someone was absent, we could easily catch up by filling in all of the rows of word up to a certain word. I would put a sticky note under the last word to be written. It was only one a day, unless they were absent. Just make it so that the paper and the board match exactly, and you’ll have no problem. We also added a sheet for problem solving and called it the “Word Problem of the Day”. I made up a math problem just out of my head, and they were to draw a picture and write the equation. Then they had to say whether or not they used addition or subtraction. We sometimes used a spinner or dice to choose the numbers for our problem. 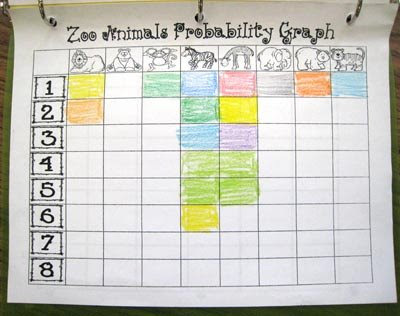 Another thing I added was a Zoo-Animal Probability Graph student copy to match the one that I already was using on the wall. There is a picture below. I put one of each of the zoo animals on the graph in a bag, and the helper of the day got to pick one animal out without looking. Then we colored in a square for each animal that got pulled out of the bag. We returned the animal to the bag each day, so it was a lesson in the probability of how often something would get chosen, given an equal chance for each one every day. We used a dry erase marker to fill in the graph on the wall so that I could erase it and use the same one next year. I think that next year, I will add an estimation sheet, and let them write their guess in a designated box on a paper that I will create. Then we will count the objects and write the real quantity in a designated spot. My kids worked on the floor because our tables are around the outsides of the room. But I made it easier to manage by putting a zippered pouch in each binder with crayons, a pencil, and an eraser. The kids had their crayons in a baggie, not in the crayola boxes that they come in. It was too hard for them to get the crayons back in the boxes. I didn’t let them keep these binders or pouches at the end of the year, so I will be using them again. Since I never sent them home, they were still in pretty good condition. Shari Sloan is very clever about the way she has her calendar masters organized. I really liked the way she gives the option of having the numbers on the calendar be dotted for tracing, or blank with no number cues written in. The boxes on the calendar that would never be used at all are blacked out, so the kids can’t put numbers in boxes that belonged to other months. I think that she recommends that Kindergartners just use the traceable pages for the first two months, and then you switch to the blank ones. Two of my special needs kids never graduated to the blank ones, but no one seemed to notice the difference. I think that is actually a pretty good way to work around special learning needs and still do it whole group. Another thing that helped a LOT in getting started (without going crazy!) was filling the calendar book in for the first few days in small groups. I showed them and modeled it whole group, and then we tried it in small groups to make sure that everyone got it. Once most of them understood what was expected, I had some of my higher, more nurturing students give assistance to my lower ones when we did it whole group. I think that helping their lower achieving peers was a really great thing for them, too! I made sure that they understood that they were not to do it FOR their classmate, but to just point out the right spot and remind them of what should go there, and to allow that child to copy theirs, if necessary. It worked! Basically, they can all do the work if they can just FIND the right spot to write it! I really liked the Calendar book, and the kids liked it too! You can find the masters for these pages here! The Write the Date pages for the 2018 and 2019 are posted. Thanks for reading!